James, I just found your podcast and I am dancing on the ceilings itâs so awesome. Interrupt guest all you want, talk about yourself, do whatever else these dumb comments are suggesting you do. Thatâs the point right ... choosing yourself. You are literally sitting across the table from greatness. I suggest you try to get all your questions answered. Plus I hate when the guest goes on too long without your comments. Iâm learning a lot from you and your guest. I started a note page in my iPhone titled â things Iâve learned from the JA podcastâ .Like yourself I try to implement suggestion from your guest into my life. Iâm using it not just for entertainment but as a class to improve my life.All the best and donât ever change dude. This used to be a good podcast, he had great guests with great ideas and thoughts to convey. Yes, his constant interruption is annoying, but talking over guests with his babbling has become unbearable. I continue to download episodes that have good guests, but then just get angry. The latest episode was 45 minutes of babbling word salad between him and his producer. I hope you read this - this is the first review iâve ever written. I have been listening to your show for about one year now; I am 21 years old and am currently finishing my 3rd year of college. Your show started out very good for me with good guests and everything. When I first started listening you would ask good questions - yes you would interrupt a lot but it was still focused on your guest. I took a break from podcasts for a while but have started back recently. I listened to the alter ego author interview the other day and knew I needed to write this review. Then I just listened today to the de clutter your mind podcast and I honestly couldnât finish it James. Your interviews are incredibly hard to finish now because it seems all you can do is talk about yourself. Guests must be beginning to resent coming on your show these days because it seems to just be all about you you you. Not only do you start trying to interrupt within one sentence of an answer but itâs just to talk more about your self. Iâm not trying to be mean but after reading a few other reviews I know iâm not out of line. I hope that you are able to read this and improve upon your interviews for your listeners, guests, and ultimately yourself. If you want a good point of reference on good listening, study Guy Raz. Anyway, I know this is long but I wanted to explain why iâm unsubscribing. I will check back periodically to see if you have decided to actually have a good show. I love the way James interviews- he is so curious and well prepared that you will learn more about his guests than any other source. James is awesome! Over the years I've listened to his podcast, and read his books and blogs and they've changed my life in a positive way. The interviews are are a lot of fun with AMAZING guests and James is always redirecting the conversation on how this could be applied and helpful to the listener. This podcast is a must listen. Thank you James!! I listened to the first 10 min of one episode. Within those few minutes he 1) mispronounced the guestâs name (she corrected) 2) got the title of her column incorrect (again, she corrected 3) got the title of her book wrong (and yes, she graciously corrected). Also within the 10 minutes he was introducing his guest, he managed to mention his own therapy and insecurity. This display shows a lack of preparation, respect for his guest, and professionalism. If he cares so little about his own podcast, why should I continue listening? James interviews a wide range of guests from all different industries. He always provides brilliant insight. Definitely worth the hourâs listen! interviewed with a unique perspective, by a unique guy! Gets better each episode! I listen to podcasts almost every single day, and this is one of the best. James has a way of pushing past the fluff and getting to the meat of the issue with some of the most brilliant minds in different areas of expertise.The conversation flows so naturally on this show. You donât feel like youâre listening to an awkward promotional effort for some authorâs book like you do with so many other shows. The James Altucher Show has become part of my daily routine and I cant get enough of it. The second I wake up, I get a litter stretch in and cook breakfast. This show comes on as soon as I roll out of bed. Thereâs a valuable lesson learned in every episode, no matter the guest. James is a great interviewer who does his homework and asks his guests deep, thought-provoking questions. Some shows are mindless motivation, some are informative, and others are just entertaining, but James manages to do it all. This podcast is a constant stream of inspiration and ideas. It took a while for James to grow on me. I simply listened because of his great guests. After about two seasons, he is now among my favorites. I love how he simply models curiosity, wise questions, sincere preparation, putting himself out there, and trying new things. Thanks for the practical advice! 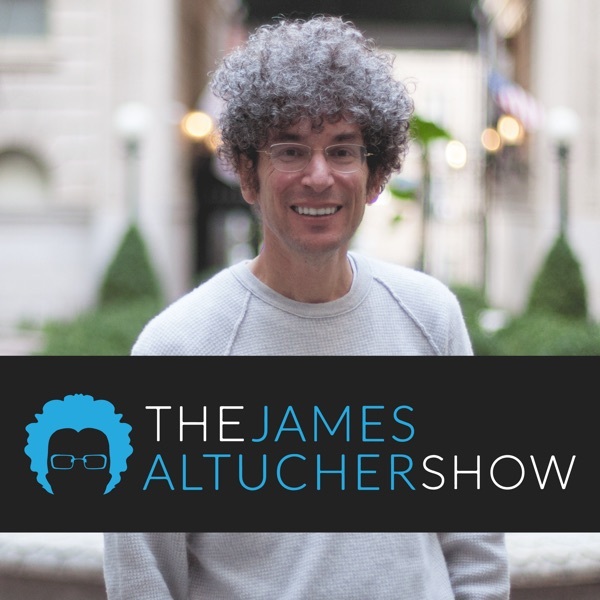 For me, the James Altucher Show has everything that you're looking for in a podcast. Interesting guests, entertaining interviews, and of course, information that you can take and immediately apply to your personal life. Thanks for putting out such a great podcast! James I really love your show, Your story inspires and motivates me to live and be my best. Thank you! I think itâs great that he allows mistakes, like when got got stood up by the guest. I feel like most people try to hide the downside or the âuglyâ or the not so successful moments and it makes them seem perfect and intangible. Seeing him making mistakes and accepting them makes me think that maybe itâs not so bad to lose once in a while and that it really is part of the game. I allowed myself to make more mistakes and to be ok with it. Itâs a valuable lesson. Thank you James! James does such an amazing and unique podcast. I have gotten so much value from the wide variety of guests he has on the podcast and the style in which he interviews them. Definitely one of my top five podcasts not only for self improvement but also for entertainment. Thanks James! James is amazing! And his podcast is even more amazing! If you are looking to improve your life, and have about three hours than listen to The James Altucher Show. His show will make you a better person! Thanks James for alll that you do. James Altucher's podcast is incredible, but he might produce too much content. I find myself several shows behind quite often, so there are some I never listen to. If he releases one which immediately catches my interest, I listen right away; however, I am certain that I am missing some great stuff. Recently, he announced that he would be dropping down to two shows a week -- that's good, becasue maybe I can keep up, but bad because he's probably not covering everyone he wants to. The recent conversation with Jordan Harbinger was great. James asked many of the questions I had been wondering about, e.g., what was the "rest of the story" regarding the change at the Art of Charm. Jordan provided excellent information and insights, especially when he said that A.J. Harbinger is NOT HIS BROTHER. Blew my mind!!! James, keep up the great podcast; it's greatly appreciated! I've been listening to James for years and I have to say that the latest episode with Jordan Harbinger was one of my favorites. You two clearly click and have great vibes between you two when it comes to stories and advice. Have him back more often! I'm new to the show and think this is promising. James is so funny! James is great at asking creative questions which keeps the interview engaging. The guests are great and informative. I love this podcast and have learned so much from listening to it! Thanks James! Consistently interesting and great guest interviews. This podcast gets it right. Both in terms of quality and content. Love the conversational/inquisitive tone of the host. Listen and learn. James is one of my inspirations. The idea machine is great and I love his podcasts. He has on bhg bands and no names too. He researches his guests a lot. Such good information and truly this is fun. James asks the questions no one else will. By far my favorite Pod Cast. I learn something with every episode! Thanks! This show is a treasure trove of interviews. I enjoy them so much I listen at 1x speed. Only wish he would have more women guests. Like a living room chat. Recently found this podcast through another podcast. Mr. Altucher is an engaging and enthusiastic host. I leave each episode feeling inspired to do better, but also fulfilled. Just great! I have been listening to this since a year and half now. Now my commute has shortened and I can't finish episodes as fast as I could . So sometimes I pretend that I need something far away . I adore James Altucher. He is seemingly laid back in his approach, but he is so clearly well prepared and he is so curious that he sometimes interrupts to ask something -often something I didnât understand either. Always a great listen, and I always learn something. Episode 252. I cannot count the number of times James stops his guest from pursuing his train of thoughts. James will interrupt his guest at least 20 times during the podcast and he seems to talk as much as his guest. Seriously annoying. Even Brandon has to go back to his original answer before he can answer a question asked while he was explaining something. Thoughtful, practical questions and responses. Ive been listeing to the show for about 8 months and loved it from the first episode that I listened to. Today I listeded to the show with Adam Carroll. First let me say that I am an avid listener to various health and wellness podcasts , I found this episode to be one of the weakest and most uninforming shows that James has done. All of Adams information he claims is based on "studies" which it may very well be but that does not make it all correct. While I think he was right on some things he was vague and ambivilant on most. If this makes you feel good do it , if it doesnt them stop.... I was looking foward to a much more in depth well researched show and was quite disappionted . While I know James has a love for comedy it seems that more and more shows are based on entertainment and comedy , Im becoming disinterested. Still think James is gerat !! Some of your shows fall short. Your recent interview with Yuval Noah Harari was too much for me. Some of Yuvalâa and your hypotheses on what was, what is, and the future were borderline silly. The design of you and all life on this planet is way to complex and precise to be explained by the religion of evolution. If you are really open minded, maybe you should interview someone like Greg Koukl at Stand to Reason. Intelligent design is all around you. God, Judaism, Christianity are fiction!? What makes you so sure? Who owns the plumb line of truth? It isnât Yuval? You seem to let every wave and wind blow you around. James asks better questions than anyone. His style lends to really unique conversations and I always learn something fun! Plus fantastic guests. James, love your podcast with Jordan B. Peterson, it really made me think about the world much differently. I love everything about this podcast, I became an Altucher fan after reading Choose Yourself and I will continue to support anything he does. With that said, PLEASE try to be more aware of your word fillers (umms, and soâs) I beg of you. It makes it really hard to stay interested in the topic if you ask the same question five different ways or if you try to rephrase every answer. James & team produce a show with rich content, which is interesting, and diverse. Full of great insight into life.